Holy Trinity Church, Sloane Street, Belgravia, London. Holy Trinity Sloane Street was built in 1888–90 at the south-eastern side of Sloane Street, and designed by the architect John Dando Sedding in the Arts and Crafts style. Replacing an earlier church of only 50 years standing, its magnificence was described by John Betjeman as the ‘Cathedral of the Arts and Crafts Movement’. It has a spacious and light interior, richly furnished with finely crafted stained glass, sculpture, and metalwork. 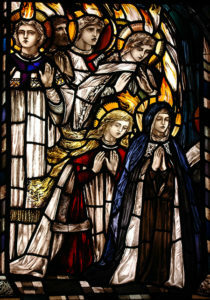 Its important collection of stained glass, includes the vast Great East Window by Edward Burne-Jones and William Morris and Co. – the largest the company ever made, and a set of clerestory windows and two windows on the south nave by English stained glass artist Christopher Whall (1849–1924) who was one of the most important stained glass artists of the 20th century. The Art Workers’ Guild, founded in 1884, and the Arts and Crafts Movement in the late 1880’s sought a return to the role of the designer-maker, with the artist directly influencing the means and materials involved in realizing a commission. This period coincided with Whall’s career as an independent designer and maker of stained glass, which began in the late 1880s. 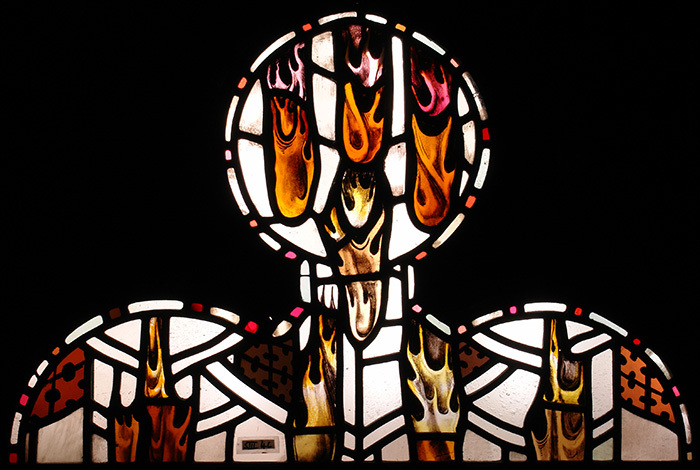 He was determinedly self-taught in all the practical processes of the craft, so that, after 1907, when he set up his own workshop, no part of the making of his windows would be beyond his control. Previous to that point he was reliant on the skilled craftsmen employed in the major firms at the time, to construct his designs. 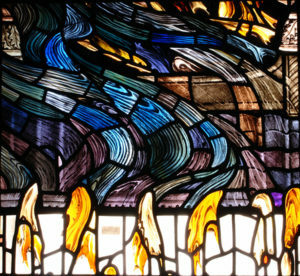 Whall was also one of the earliest stained glass artists to make use of ‘slab’ glass. Invented in 1889, it is produced by blowing glass into a square mould; the resulting box of glass is then cut into small rectangles which are thicker in the centre than at the edges. 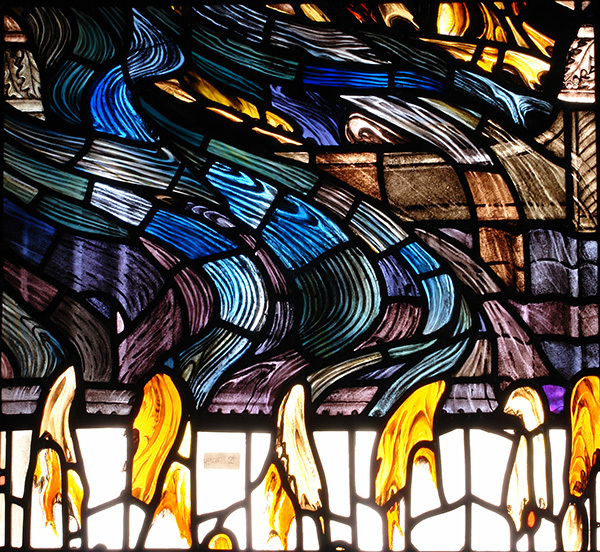 The glass is beautiful and interesting in the way it holds and transmits light, and was much favoured by stained glass artists from the Arts and Crafts period. Work was carried out by HWG at Holy Trinity on two separate occasions. The first occasion comprised on-site cleaning of the East Window and all the clerestory windows, as well as workshop conservation of two of the Christopher Whall windows from the south nave. These panels were bowed, broken, and dirty; necessitating removal to the workshop for glass repairs and re-leading. On the second occasion HWG carried out repairs to a severely vandalised panel. As a result of an intruder attempting to enter the church via this single stained glass panel, a large hole had been pierced in the centre, which had previously contained two angel figures. The outside portions remained intact. The panel was removed from the window, and a substantial number of fragments were salvaged from site that had fallen out of the panel. In the workshop the panel was partially dismantled, limited to where the impact damage had occurred. After cleaning the glass and edge-bonding the broken sections the pieces were reassembled. Those areas completely missing were filled with matching painted and kiln-fired glass. Finally, the repaired elements and new insertions were re-leaded into the panel framework, and made ready for fixing on-site.